"A Motorola XOOM update will be made available [today] that brings a bunch of fixes to the device including Bluetooth support on Google Talk and for a mouse, proxy support, and a new picture transfer protocol." 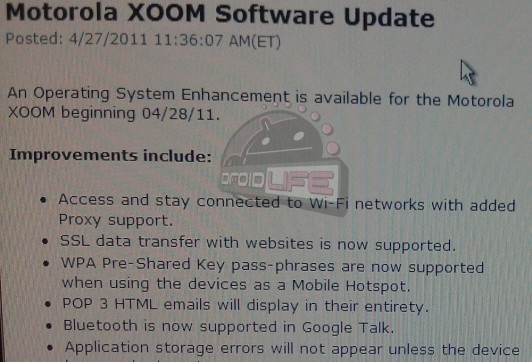 A PDF from Verizon introduces the latest update for the Motorola Xoom Android tablet. Is has a number of fixes like for HTML display of POP3 email as well as a few new features like support for a Bluetooth mouse. I'm not sure how Android would be with a pointer but it would be fun to at least try. I wonder if they have a way to do two finger gestures with the mouse, like rotating the display in Google Maps...anyway, it's great to see that so many issues are addressed. The update is only 28MB, which doesn't sound too big to me. Unfortunatly it doesn't add support for the MicroSD card slot. I'm not sure what's up with that since apparently the MicroSD card slot is fully functional out of the box on the Asus EeePad Transformer. Please let us know if you give this update a try. Does it work as advertised, do more, or less?